I have discovered that I love and ADORE elotes. For those of you who have not had the pleasure, elotes are a Mexican dish made up of corn – either on the cob or cut -slathered with a mixture of Mexican crema, queso fresco, and other seasonings like lime, cilantro, and hot sauce. My first experience with elotes was at a dingy little cart outside a gas station taco stand in Dallas. Classy, no? The woman who runs the cart serves nothing but elotes, and they usually have a line around the building. I had to have them, so when my turn arrived I ordered a small. 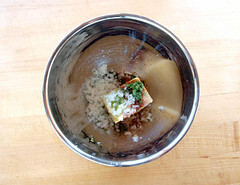 She layered canned corn with a mixture of liquid margarine, lime, crema, a hefty squirt of hot sauce, and queso fresco into a foam drinking cup and topped it with a plastic spork. I must admit, I was skeptical, I mean liquid margarine and canned corn? But, the line WAS around the building and that usually indicates goodness. So, I took a small bite and instantly regretted getting the small as I devoured the rest. They were so tasty, creamy, and spicy. I was smitten! In fact, I was inspired to make them at home – with better ingredients of course. You can often find them on my table as a side dish for grilled or smoked meats. They make me so happy! 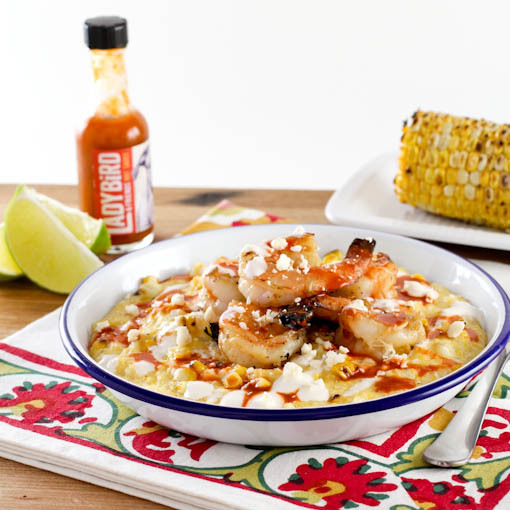 Elotes are simple food, so my attempt to gussy them up led to combining them with shrimp and grits – another simple yet delicious dish. 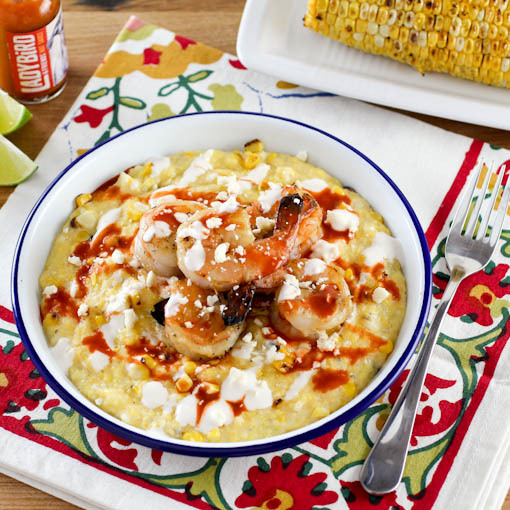 Southern comfort meets Tex-Mex, or shrimp and grits turned up to 11! If you can’t find Mexican style crema you can substitute full fat sour cream mixed with a enough lime juice to thin it some. It is not exactly the same but it works in a pinch. These are best fresh out of the pot, so if you can put the shrimp on the grill just as you start to whisk in the grits. This way they are done about the same time. My last bit of advice is this, do not use instant grits for this recipe. 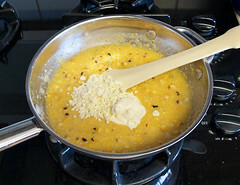 Quick-cooking grits, which have a better texture, cook in about 7 to 10 minutes, and can be found in most markets. I prefer the Bob’s Red Mill brand if you are looking for a suggestion. Begin by grilling the corn. Heat the grill to medium-high heat. Brush the corn with the oil and season with salt and pepper. Grill until the corn is slightly charred and tender, about 10 to 15 minutes. Set aside to cool, then cut off the kernels and set aside. Next, prepare the shrimp. In a small pot over low heat combine the butter, onion, garlic, cilantro, lime juice, lime zest, chili power, salt, and pepper. 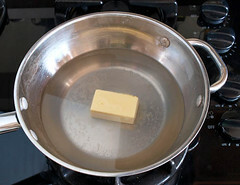 Once the butter has melted set aside to cool to room temperature. 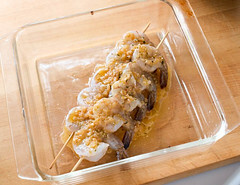 Skewer the shrimp and pour half the butter mixture over the shrimp. Marinate for 10 minutes then transfer the skewers to the grill. Cook for about 2 minutes per side, brushing with the reserved butter mixture, or until the shrimp are opaque and firm. 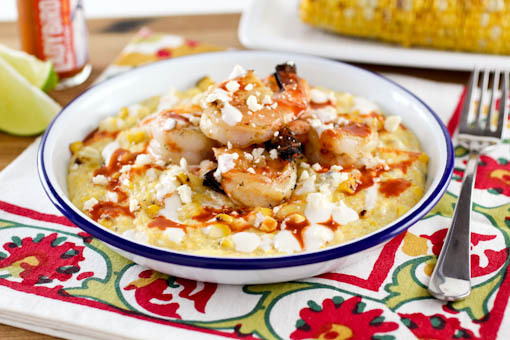 Remove the shrimp from the grill and wrap in a double layer of aluminum foil to keep warm while you finish the grits. In a saucepan combine the water, lime juice and butter over medium heat. 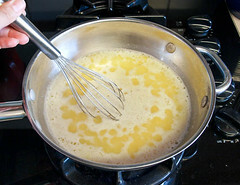 Once the mixture comes to a boil slowly whisk in the grits. Cook, whisking constantly, until the grits thicken and are tender, about 5 minutes. 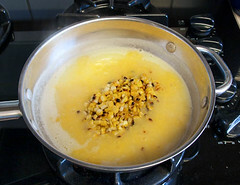 Reduce the heat to medium-low and stir in the grilled corn and cook until the corn is heated, about 1 minute. Next add the salt, crema, queso fresco, and hot sauce. 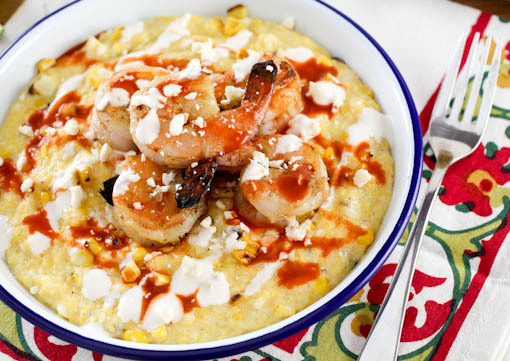 Serve the hot grits with the shrimp and extra crema, queso fresco, and hot sauce as desire.